Community Mennonite Church in Harrisonburg, Virginia, 2012. 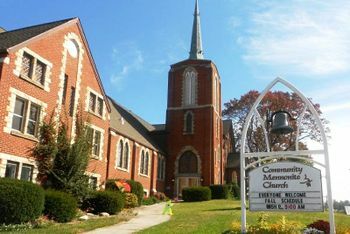 Community Mennonite Church in Harrisonburg, Virginia was started in 1972 by persons related to Eastern Mennonite College with the vision of being a group located in the city in close relationship with Christ and each other. Out of this vision, small groups developed as the primary unit of congregational life and structure. In 2014 the congregation was served by Ministers Jennifer Helen Davis Sensenig and Jason Darin Gerlach. It had a membership of 291. Thiessen, Richard D. "Community Mennonite Church (Harrisonburg, Virginia, USA)." Global Anabaptist Mennonite Encyclopedia Online. March 2014. Web. 26 Apr 2019. http://gameo.org/index.php?title=Community_Mennonite_Church_(Harrisonburg,_Virginia,_USA)&oldid=117499. Thiessen, Richard D. (March 2014). Community Mennonite Church (Harrisonburg, Virginia, USA). Global Anabaptist Mennonite Encyclopedia Online. Retrieved 26 April 2019, from http://gameo.org/index.php?title=Community_Mennonite_Church_(Harrisonburg,_Virginia,_USA)&oldid=117499. This page was last modified on 8 April 2014, at 05:51.